Sunday in Cleveland, they put their foot on the Browns throat, showing Manziel just what it was like to play as a rookie QB in the NFL. 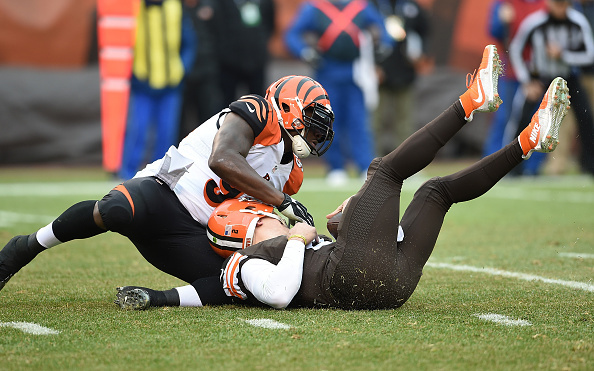 Manziel was harassed all day by the Bengals defense, and Cincinnati used a punishing run game to pound Cleveland 30-0 to move to 9-4-1 on the season. The Bengals defense took it upon themselves to shut down Manziel, holding him to an awful day in which he went just 10-for-18 for 80 yards with two picks. He was sacked three times and only ran for 13 yards on five carries. He didn’t fool the Bengals D all day, and paid for it more than once when he did escape the pocket with big hits. The Bengals slammed the Browns on the field and in the boxscore, recording their first shutout since Dec. 21, 2008 – in Cleveland. Cincinnati put up 347 yards to Cleveland’s 107. The Bengals picked up 24 first downs to five for the Browns, who went just 1 of 10 on third down. Mike Nugent kicked two 44-yard field goals and added a 34-yarder for the Bengals, who turned a day of promise and potential for the Browns into Cleveland’s worst nightmare. Cincinnati led 20-0 at halftime, putting the game away. Bengals rookie Jeremy Hill rushed for 148 yards and two touchdowns, as Cincy put up 244 yards on the ground. Dalton wasn’t great, but he didn’t have to be, as he was just 14-for-24 for 117 yards and a pick. He didn’t make any big mistakes through that would have allowed the Browns to hang around. Bengals come from consistent wins versus Browns and Broncos, looks like they can do better this time come January.